We don’t like to talk about terminal cancer. The term alone can bring tears and the feeling of loss of hope. Yet even if you are given a diagnosis of terminal or end-stage cancer there is hope. What can help you cope and restore hope at the end of life? It's important to first define what is meant when a cancer is terminal. While definitions vary, deciding that a diagnosis is terminal usually means that cancer cannot be cured and that there is a limited amount of time left to live. In a hospice setting, this may be defined as six months but could be shorter or longer. 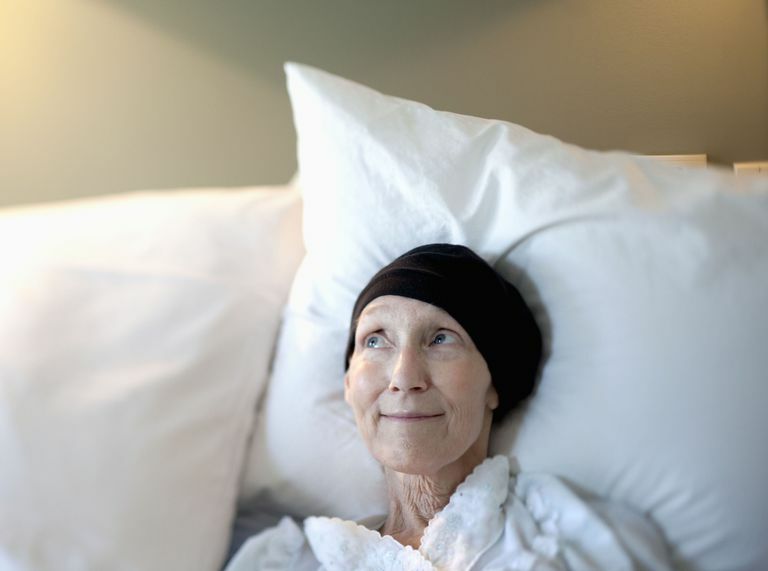 Another way of defining a cancer diagnosis as terminal is when a time comes when the side effects of treatments designed to prolong life outweigh the benefits of these treatments. Stating that a cancer is terminal does not mean that all treatment stops. Rather, it often means that instead of focusing on treatments meant to cure cancer or prolong life, treatments instead focus on providing comfort and the best quality of life possible during the time that is left. Below are some tips that have helped some people deal with a diagnosis of terminal cancer. Just as everyone is different, you may find some of these tips to be helpful, whereas others do not meet your specific needs. In addition, just as there are many stages of grief that don't necessarily occur in order some of these tips may be helpful one day but not another. A dear friend found humor to be a mainstay of her last days with cancer. She asked friends to email her funny sayings and quotations, to send funny cards and bring her funny videos to watch. She found that laughter not only helped her cope with each day but decreased her pain significantly as well. It's important to be sensitive if you have a loved one coping with this diagnosis and to be forgiving of yourself if you are coping with your own terminal diagnosis. There will be days when you don't want to laugh. There will be days when you need to express your grief and days when the last thing you need is for anyone to suggest that you be "positive." Still—opening your heart to the power of laughter and humor. It can be incredibly draining to continuously answer questions about how you are doing, not to speak of explaining the choices you have made or not made about treatment. Think of a like-minded person amidst your family and friends. Preferably someone strong, who can speak your wishes for you when you don't feel strong enough yourself. Think of someone who is flexible (it's hard to predict when you may need their support) and someone who doesn't mind fielding calls, sending off emails, and updating your Caring Bridge site if you have one. Let’s face it. We all have people in our lives who we enjoy, and people we basically just tolerate. When you are told you are terminal, family and friends may come out of the woods hoping to see you one last time. You might be afraid that you will offend loved ones by standing firm when you don't want visitors or need time alone. There is nothing wrong with being true to your needs and feelings. There is nothing selfish about wishing to spend time only with those people who lift your spirits. It may help to take some time and discuss the people in your life with your spokesperson and talk about ways to gently but firmly set the boundaries you need in order to surround yourself with those people who will help you enjoy your last days to the fullest. Check out these tips on keeping a positive attitude with cancer, while remembering that you don't always have to be positive. Surround yourself with positive people who allow you to be yourself and express your negative feelings about cancer as well. You may find that the last stages of cancer are in some ways freeing. Not having an anticipated long future can free you to live in the present—the only time that any of us really have. We can't change the past, no matter how much of the present we spend fretting about it. When you are given a terminal diagnosis, the diagnosis affects your entire network of family and friends. Fearing your loss, tempers can erupt and disagreements occur between family members. Although this is stressful, it is very normal. We all cope with sad news in different ways. It is extremely common for family members to encourage just one more treatment. Or perhaps an alternative treatment or travel to Germany. The first thing is to understand what you want. Taking a short while to listen to your well-meaning friends and family members demonstrates your respect for their caring. But after that, your loved ones need to let you make your own choices and respect you. Perhaps getting a second opinion or checking out one of the clinical trial matching services will help your loved ones reach the stage you are now at in acceptance. Fear can be paralyzing when you hear that your diagnosis is terminal. You may be worried about pain. Are you afraid of death? What will happen to your family? And one of the greatest fears, the fear of dying alone. Taking time to bring these fears out of your subconscious may help them seem more manageable and less frightening. It seems like talking about saying thank you would not be worth mentioning. Of course, you feel gratitude towards those who have helped you. We add this not as something you need to do for others, but for yourself. Of course, your loved ones know you love them and are grateful for your presence in their life. Yet, in talking to many people near death, the questions recur. "Will my loved ones know how much they meant to me?" "Will my loved ones know how much I loved them?" Perhaps take a few moments with your spokesperson and write a note to your loved ones doing nothing other than saying "Thank You" and "I Love You." Yes, your loved ones know. But when you wake up questioning at 2 am and drenched, you can go back to sleep knowing that yes, you took an extra moment to say those words. If there is something you wish to say, don't be afraid to express yourself. You don't have to be "brave" despite obituaries that seem to praise ignoring your true feelings. If you in pain, perhaps frustrated at a delayed diagnosis or the limits of medical care and mourning the life they had hoped for that will never be, you may need to express your anger. As it happens that anger is usually “dumped” on those who are doing the most and loving the most. Taking a moment to say you are sorry may help your loved ones move on more comfortably in the days that follow. When you are told you are terminal, you may feel a need to resolve differences in relationships. Sometimes this is possible, other times, it is not. Is there someone you wish you could talk to for a moment? Some people wish to play in active role in planning their life celebration (funeral) while others are not interested at all. There isn’t a right or wrong and family and friends need to respect your choices. If they want you to make recommendations and you don't want to, that's fine. Or they might not want to talk about your funeral with you, but many people get a lot out of contributing to their last service and you have every right to do so. It may be choosing your favorite songs. Or sharing memories and expressing a wish for certain moments to be included in a eulogy. Hope for blessings for your children and loved ones who will remain after you are gone. Many people find hope in what comes after death. And whether or not your beliefs fall into these categories, many people find comfort in reading the stories of those who have had near-death experiences, the experiences of hospice nurses in hearing about those who are dying being "visited" by relatives gone before, and the stories of others who have witnessed events that bring assurance about an afterlife. A personal favorite is a collection of stories ​Forever Ours: Real Stories of Immortality and Living Written by a Forensic Pathologist shared by Janis Amatuzio, a pathologist who has shared stories that family members have shared with her over the years—stories that have brought comfort to many. Those of us who do not have terminal cancer often feel we are providing support by mentioning further options. When this occurs, those living with the disease not only have to cope with their own feeling and fears alone but end up trying to support us. As a society, we need to learn more about supporting people at the end and not equating "winning" with adding a few more days. Living a good life and facing a good death are important for each and every one of us. And to be able to add the adjective "good" to both, we need to have meaningful hope. No matter your prognosis, no matter your faith, and no matter the state of your relationships, there are reasons to find hope. The last days and months of life can be a wonderful time to reminisce about good times, repair (when possible) broken relationships, make sure you are comfortable with all of your treatment decisions, and in this, feel a comfort at the end of life. Living with terminal cancer is not a time to be stoic. If you're struggling with this, think of the example you wish to leave behind for your loved ones to follow. Do you want your friends and family to be open about what's in their heart and express their feelings? This is the time to do likewise. Coping with terminal cancer is heart-wrenching both for those who are dying and for those who are left behind. But while you or your loved one are still loving, there is still time for hope. Greer, J. Jacobs, J., El-Jawahri, A. et al. Role of Patient Coping Strategies in Understanding the Effects of Early Palliative Care on Quality of Life and Mood. Journal of Clinical Oncology. 2018. 36(1):53-60. Jacobs, J., Greer, J., El-Jawahri, A. et al. The Positive Effects of Early Integrated Palliative Care on Patient Coping Strategies, Quality of Life, and Depression. Journal of Clinical Oncology. 2017. 35(31):92. Nipp, R., El-Jawahri, A., Fishbein, J. et al. The Relationship Between Coping Strategies, Quality of Life and Mood in Patients With Incurable Cancer. Cancer. 2016. 122(13):2110-2116.